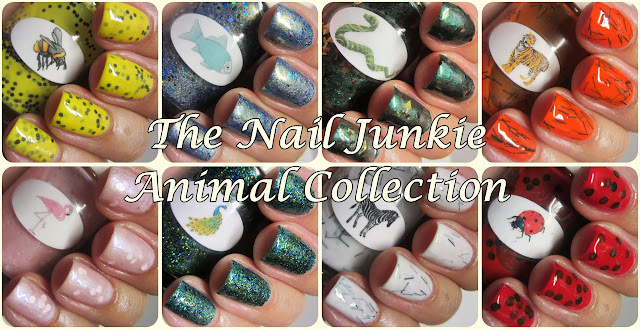 The Nail Junkie: OFFICIAL RELEASE AND GIVEAWAY: My Animal Polish Collection! 3 ALL NEW SHADES! OFFICIAL RELEASE AND GIVEAWAY: My Animal Polish Collection! 3 ALL NEW SHADES! I have some exciting news to share with all you. A bright outspoken yellow polish that contrasts a bold sunny yellow with the darkest of black. Bee is a blend of matte black hex glitter in a bright yellow shimmer base. It is a full coverage polish that can be worn alone. A blue-silver-holo polish that as multifaceted as the glimmering fins of a fish. Fish is a blend of fine green and blue glitters, sapphire holo glitter, silver holo glitters swimming in a flashy pool of metallic silvery blue base. It is a full coverage polish that can be worn alone. A deep emerald polish with all the color and texture of a fine snakeskin handbag, without the cruelty. Snake is a blend of brown glitter, gold diamond glitter, super fine green glitter custom blended into a rich emerald shimmery base. It is a full coverage polish that can be worn alone. A bright pop of orange covered in black stripes. Tiger is a blend of thin black bar glitter in a bright orange creme base. It is a full coverage polish that can be worn alone. A pink glitter polish that's as light as a feather. Flamingo is a blend of clear holo glitter, matte white glitter, super fine silver holo glitter all mixed into a opalescent pink shimmery base. It is a full coverage polish that can be worn alone. Now, without further ado, let me introduce you to the newest additions to The Animal Collection. A tri-colored blend of micro glitter and jelly that catches the essence of the shimmery, glistening feathers of a peacock. Peacock is a mix of gold, blue and green micro glitters all floating in a barely there blue jelly base. This glitter bomb is a full coverage polish that can be worn alone. Zebra is a wild contrast of black and white. Zebra is a white jelly polish with black bar glitter throughout that gives you the appearance of Zebra stripes on your nails. 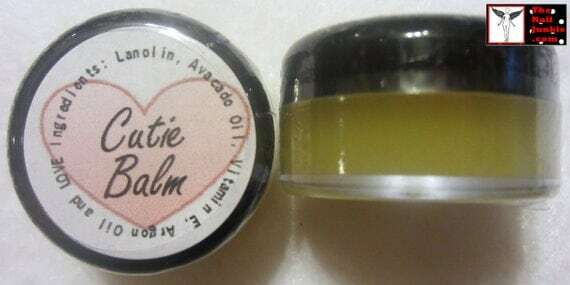 It is a full coverage polish that can be worn alone. Ladybug is red shiny polish spotted all over. Ladybug is a red jelly polish with large matte black dot shaped glitters. It is a full coverage polish that can be worn alone. Here is two coats of each of the polishes on clear swatch spoons. To celebrate the release of these new additions to "THE ANIMAL COLLECTION" I'm going to give everyone a chance to win 2 colors of your choice from my shop. This giveaway is open internationally and ends 9/30/13. Thx for this amazing giveaway. Had a little problem entering in raflecopter & it wouldn't let me paste my links in the boxes. So I hope it's ok if I just left them here. My fingers are crossed. Thx. Much love. your polishes look amazing!! doing a great job!! Hi!amazing collection and thanks for the giveaway!! Fish and peacock are amazing!